The campaign story Trump told about self-enriching globalist elites was that they have employed permissive immigration and misguided or corrupt trade policies to subject U.S. workers to debilitating labor competition from border-crossing migrants and slave-wage workers in China. Trump supplemented this economic nationalism with vows to make wealthy investors pay more, secure huge job-creating infrastructure expenditures and protect social insurance — thus promising a broad, dramatic ideological break with the GOP. All that’s left of this vision, of course, is Trump’s draconian immigration crackdown, which is spreading terror and misery in immigrant communities, and Trump’s trade war, which is threatening to upend complex global supply chains and is badly rattling our international alliances. On everything else, Trump threw in with traditional GOP plutocratic priorities: He has done all he can to gut consumer, financial and environmental regulations; his tax plan lavished huge, regressive benefits on the wealthy; his infrastructure plan vanished; and his vow to replace Obamacare with better coverage “for everybody” morphed into a failed effort to cut health insurance for millions (to facilitate tax cuts for the wealthy). Yep. Trump's plan isn't even economic nationalism, Sargent adds. It's just xenophobic nationalism. The only good news here is that even people who voted for him in 2016 have had enough. 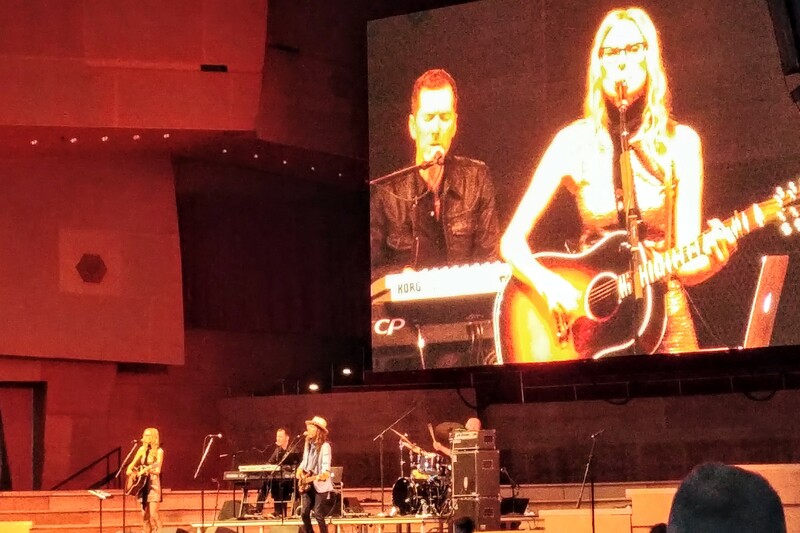 Aimee Mann performed last night at Pritzker Pavilion in Chicago's Millennium Park—for free! So naturally I went. The weather couldn't have been better, so the picnic area was totally full. Which meant that the pavilion itself had plenty of seats. Which meant I got to see her directly rather than just projected on a big screen. I love Aimee Mann's songs. I am conscious, however, that when her songs become my life's soundtrack, things are seriously out of joint. Sample lyric, from "Long Shot," which opened her 1996 album I'm With Stupid: "You fucked it up / You should have quit / Til circumstances / Had changed a bit." Or from "Save Me:" "You look like / A perfect fit / For a girl in need of / A tourniquet." Seriously good, but seriously unhappy. But totally worth the ticket price, I must say. And now I need to download Mental Illness, her last album. In New York, P.T. Barnum was paying Jenny Lind—“The Swedish Nightingale”—$1,000 a night to perform. Chicago’s first opera didn’t have Jenny Lind. But the local promoters were crafty enough to choose one of her biggest hits for their first show, at Rice’s Theatre. The opera was Bellini’s La Sonnambula. Four singers are not enough for an opera. So the Chicago cast was filled out with local amateurs. A few of them had good voices, most of them didn’t. Rehearsals were—I think “confused” is a good word to describe them. Just like in one of those bad old Hollywood movies, the show had problems. The audience kept applauding at the wrong time—whenever one of the hometown amateurs showed up on stage, his friends in the audience would stand up and cheer. Meanwhile, one of the extras named J.H. McVicker sang so loudly he drowned out everybody else. It helps to remember that 18 years after the city's founding, it more resembled a frontier town than the international metropolis it became in the 20th century. Still, it sounds like a fun show. It's 25°C and partly cloudy today, so I'm spending as much as possible outside. Regular posting will resume when I'm once again trapped inside by some unfortunate event, like work. As London broils in 34°C heat today, New Republic's Emily Atkin asks, "Why are some major news outlets still covering extreme weather like it's an act of God?" The science is clear: Heat-trapping greenhouse gases have artificially increased the average temperature across the globe, making extreme heat events more likely. This has also increased the risk of frequent and more devastating wildfires, as prolonged heat dries soil and turns vegetation into tinder. And yet, despite these facts, there’s no climate connection to be found in much news coverage of extreme weather events across the globe—even in historically climate-conscious outlets like NPR and The New York Times. These omissions, critics say, can affect how Americans view global warming and its impact on their lives. Meanwhile, the Guardian (who, one hopes, have air conditioning in their offices) are reporting that 87% of the earth's oceans have human-caused damage. [Research director Ric] Gillespie has been trying to debunk that finding for three decades. He believes that Earhart spent her final days on then-uninhabited Gardner Island. She may have been injured, Noonan was probably worse, but the crash wasn’t the end of them. Gardner Island, now called Nikumaroro, fits the classic description of a desert island: it's a small atoll with trees and a very long swim to the next nearest land mass. Crashing there might have meant a slow death from dehydration instead of a quick one from impact. We'll never know for sure, but this new data, if accurate, adds some weight to the hypothesis that Earhart crashed on Nikumaroro in 1937. The average July high in Stockholm, for example, is usually 23°C; this week, temperatures will crest 32°C, and there are 21 wildfires currently blazing across Sweden during its worst drought in 74 years. Some municipalities have resorted to sending leaflets to older residents to give them tips on how to manage the heat. Hospitals are shipping in otherwise rarely needed air conditioning units. Swimmers might be tempting to cool off in the city’s many waterways, but hot weather has caused giant algae blooms to appear within the Stockholm Archipelago, making the water unhealthy to swim in. In the UK, severe dry conditions have also fed wildfires. Earlier this month, a large section of the grassy meadows at Wanstead Flats, on London’s eastern edge, burnt to ash—only to reignite again during another fire yesterday. This summer parts of the London region have received only six percent of their normal rainfall, leaving parks brown and reservoirs dry. The longest run of days with no rain at all this summer is 48 at Brooms Barn, near Bury St Edmunds. Several longtime Daily Parker readers live in or are this week visiting the UK. Guys: how bad is it where you are? I'll be in the Big Stink on August 31st to find out for myself. I hope it's not as grim by then. The Republican Party has been stepping up its program of voter suppression in an increasingly-desperate effort to remain in power despite being in the minority. Having hitched its wagon to the older, whiter (i.e., diminishing) part of the electorate, they have few other options, since their policies offend and repel most of the country. In many ways, today’s battles over voter ID, felon disenfranchisement, gerrymandering and more are simply a continuation of a struggle that has been going for more than two centuries, with a clear line of continuity stretching through the battle for voting rights in the Civil Rights Era South. But there are key differences between past battles and those today, ones we can now see coming to the fore in the last years of the 20th century. Restrictions on voting have long been most effective against the young, racial minorities and the poor — constituencies that, increasingly over the last few decades, have voted for Democrats. [C]hanging demographics created a simple and stark reality. Whereas attacks on voting rights did not used to clearly advantage one party over another, now voting restrictionism clearly advantaged Republicans and disadvantaged Democrats. The 2000 election with its tight margins and county officials peering at dangling chads through magnifying glasses focused Republicans on the importance of every single vote and more ominously how small shifts in the shape of the electorate could have dramatic results. In the late 1990s and early 2000s Republican politics was filled with a growing chorus of claims of “voter fraud,” usually focusing on minority and youth voting, and the need to crack down on voter fraud with new security measures (voter roll purges and voter ID) and increased prosecutions. The series we are beginning today is made up of ten articles. They will include historical perspective, as well as extensive reporting on the current moment and policy prescriptions for advancing and securing voting rights against a tide that appears everywhere to be flowing against them. We will have pieces on felon disenfranchisement, gerrymandering, history going back to the 19th century and up through recent decades, voter ID laws, automatic voter registration along with numerous related issues. We will also have reporters in the field covering events as they unfold over the next five months. Our goal is to survey the full breadth of this critical topic, examining the history, the current range of threats and opportunities and, to the extent possible, helping readers understand the scope of the issue, its importance and avenues for positive change over the coming years. The Daily Parker will be following this series with great interest.